The wharf, office and a house were on the upstream site of where the William Jolly Bridge is now. This photo is of the bins and storage areas of Moreton Sand and Gravel approximately where the Kurilpa Bridge enters the parkland today. It was the secondary part of their operations, but when the shipping on the bay began to lose out to the road and rail transport, this became their mainstay. They acquired it from a consortium of hardware retailers whose building company customers wanted a one stop shop which including the sand and gravel for their concreting. It was run poorly and without enthusiasm until Uncle Ted and his son Ray bought it. 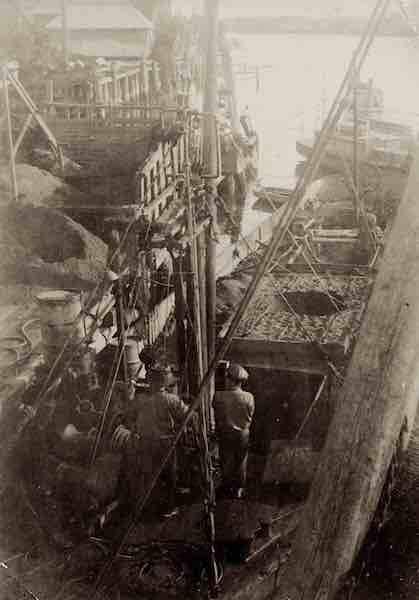 They had long been transporting sand from Stradbroke Island for the Brisbane Glassworks at South Brisbane/West End, and eventually some of their boats such as The Maid of Sker and the S’port were converted to gravel barges working the Brisbane River. The act of realising a changing market place and adjusting your business focus was a valuable business practice then, and it’s importance has not diminished in today’s world. Thanks Peter for reminding us of this important part of Moreton Bay history.